When a poisonous gas leak killed four workers near Houston earlier this month, Amy Rafano felt worried. The New Jersey PTA mom lives near several chemical plants in Middlesex County, and sends her son to school nearby – including the Ashland plant in Parlin which houses 1.2 million pounds of the flammable chemical ethylene oxide. "You start to say to yourself, how safe am I?" Rafano said. Hundreds of thousands of people live in chemical-risk zones in the tri-state area and don’t even know it, according to a report by the Center for Effective Government. “There are hundreds of facilities in New Jersey that use hazardous substances that can affect workers and the community," said Rick Engler, director of the New Jersey Work Environmental Council. Engler said there are 93 particularly hazardous facilities in the Garden State – and that a major release there could be catastrophic. Just last month, a chemical cloud rose from the Infineum Refinery in Linden, NJ. There were no injuries reported, but workers were held inside for more than an hour. Amy Rafano’s son Zac, an 8th-grader, attends South River Middle School. 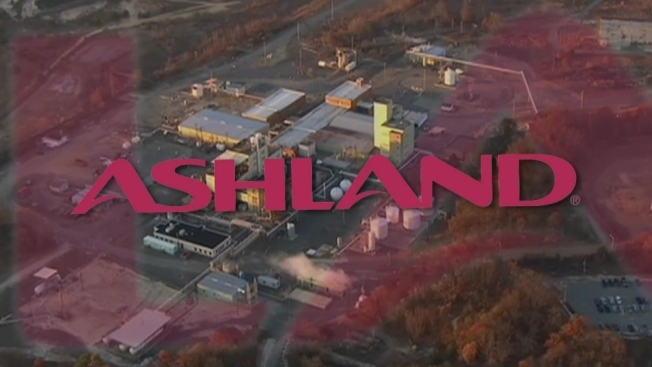 In addition to the Ashland plant, that school is near the Dupont plant in Parlin and within reach of the Equistar Chemicals Plant in Edison. Dupont, Ashland and Equistar all said they are extremely careful not to put local residents in danger. According to a spokesman for Ashland: "The detection of the smallest leak of ethylene oxide would automatically shut all valves"and "isolate a potential leak." However, New Jersey Department of Environmental Protection records show that many local plants have had lapses. In a recent state inspection, the Equistar Chemicals Plant was fined $4,000 for failing to comply with emergency response laws. "I want to know where it is and what kind of effect it will have on me and my family if something should happen," Rafano said. Both the EPA and the New Jersey DEP require high hazard facilities to submit a “risk management plan” that details the types of substances stored, the worst case scenario if there were an accident and a response plan. "It makes total sense that emergency response planning efforts be completely coordinated,” Engler said. Barry Eck, coordinator of the office of emergency management for Sayreville, said the plants in his borough, including Ashland, Hercules and Dupont, all have updated emergency management plans fled with him. But he says he takes that one step further: He shares those plans with neighboring plans, since they could be affected in an emergency too. “If the towns aren't talking to each other and you have a release, you're not going to know what to do or where to go." If you want to check which plants are near your home or child’s school, check the Center for Effective Government’s website. Just zoom in to your town and click on the flag symbols. It will list the school and the closest chemical plant.